Order Our Giant Cookie Cake today! Our huge cookie is filled with a generous supply of chocolate chips, decorated and bordered with colorful frosting. 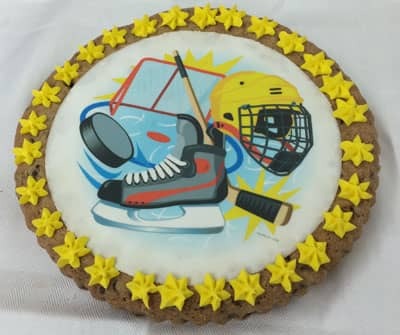 The hockey party can begin when this Giant Chocolate Chip Cookie Cake arrives! Our Giant Cookie Cake is filled with a generous supply of chocolate chips, decorated and bordered with colorful frosting. This product is fresh baked and does not include nuts. The Giant Cookie Cake is a 2 lb cookie which is the equivalent to 32 one oz cookies - enough for all to enjoy during the game. No extra shipping on two or three cakes going to the same address. So buy more and save on shipping.